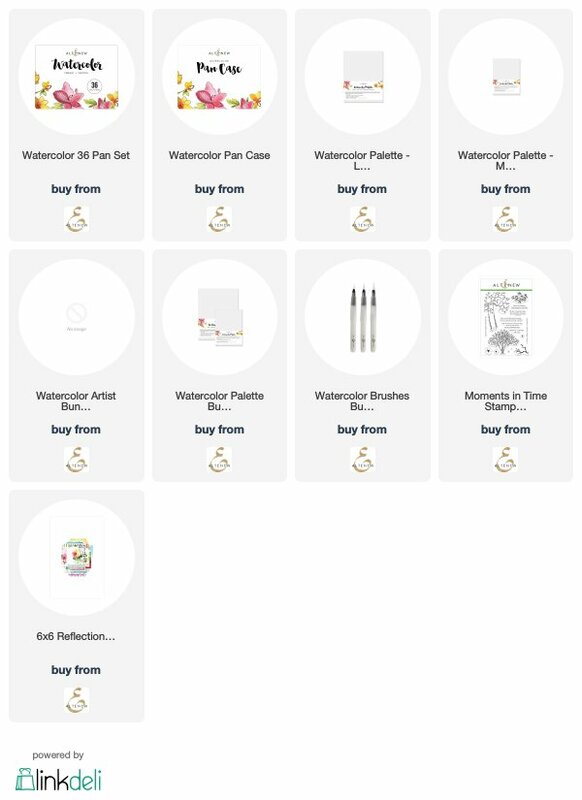 Lilith's scrapbooking venture: Altenew Watercolor Pan Release and Blog Hop. 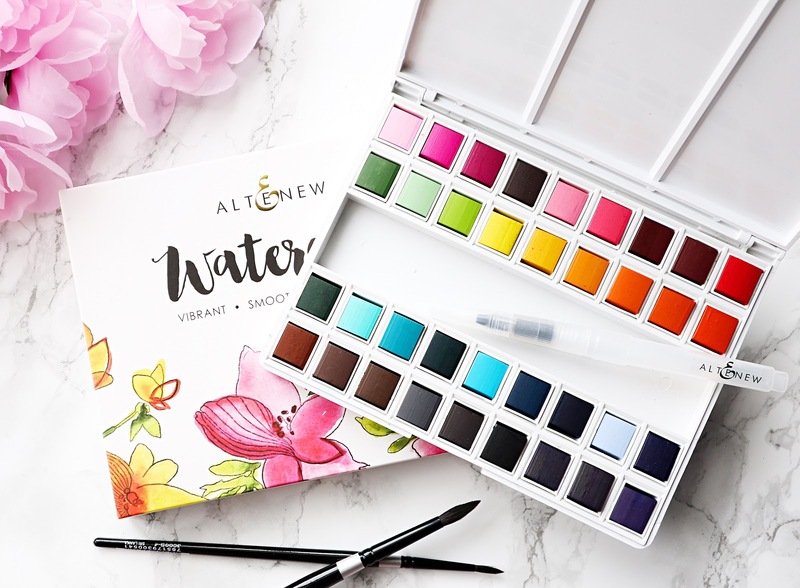 Altenew Watercolor Pan Release and Blog Hop. Kathy Racoosin's blog you are right on track. Today we finally release the Watercolor Pans. The pan is FABULOUS and I love the colours. I used the Moments In Time Stamp set and paired it the Ou Family collection. Altenew is giving away a $50 gift certificate to SIX lucky winners! Please leave a comment on the Altenew Card Blog and Altenew Scrapbook Blog by 8/15/2018 for a chance to win. 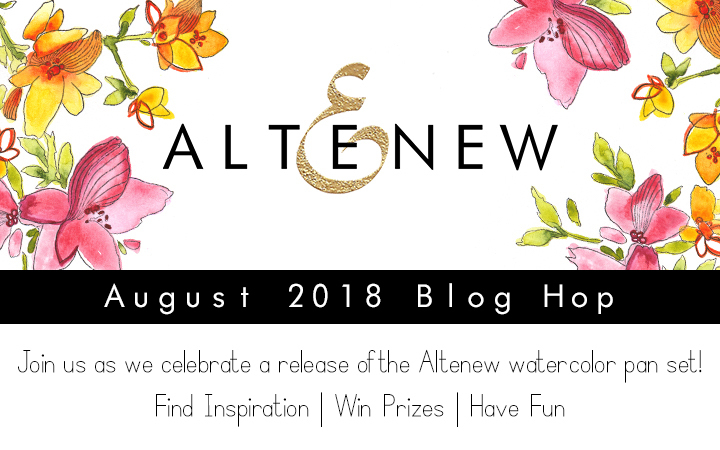 Six winners will be announced on the Altenew blogs on 8/19/2018. I'm giving away a 30$ gift voucher to the Altenew Store. Just leave a comment and I'll pick a lucky winner on August 15th. Wonderful layout and lovely color choices. Cute layout. Thanks for sharing the color names of the watercolors. Gorgeous layout! And the colors really are vibrant. I love your layout! This new watercolor set looks amazing. Love your project - those colors are so vibrant. I like how these colors will blend in well with their inks. Thanks for sharing and for the chance to win! Beautiful layout. Love the colors! I like your layout and like how the watercolors turned out on this page. This is a lovely page, Lilith. I always enjoy your work and your videos. These watercolors look fantastic. I am looking forward to giving them a try. So pretty! Delicate and charming, perfect for a new baby page. I am anxious to try these new paints. Thanks for sharing your talent. 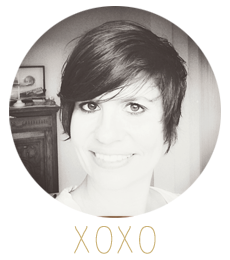 I love your pretty layout and design! The sing in the cherry tree is such a perfect touch, and it's one of my favorite Altenew stamps too! It all looks beautiful! Love how you incorporated the water coloring to your scrapbooking pages. Beautiful! Gorgeous layout! I love the watercoloring you did and that image you used is perfect for the page! Thanks for the inspiration! Such a steady and creative hand. It is such a timeless page. Beautiful page and layout. Love the watercolored background on your beautiful layout page. I can't wait to receive my watercolors and use these gorgeous colors in this set. I'm excited because I have some of the inks, too! So pretty! I love the free clean layout! 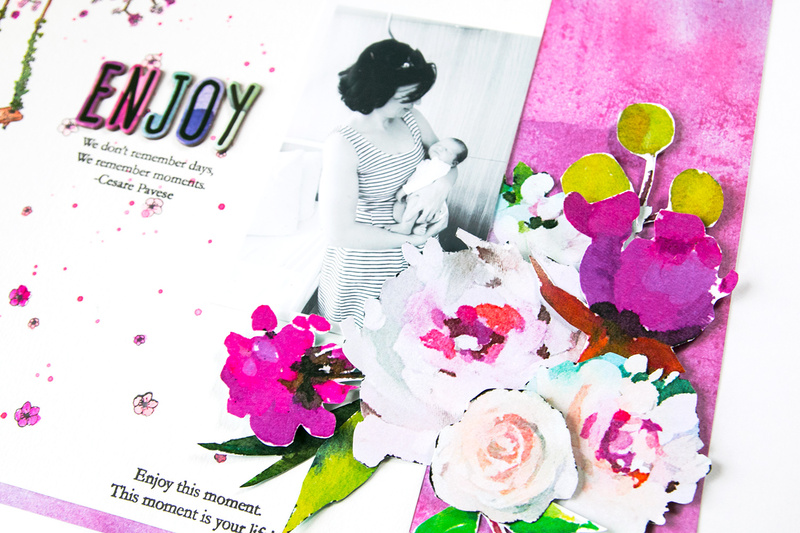 wonderful layout, Lilith - such a sweet page to remember that new baby! Absolutely love this! A watercolour set that is compact, easy to carry around, that co-ordinates with all my Altenew Inks. Love that the pans can be taken out so that individual colours can be replaced that are used more often. And the inspiration is awesome! The layout was just beautiful.....love how soft the watercolors are...yet when you need them to be bold, they can hit that mark also....awesome job. Thank you so much. 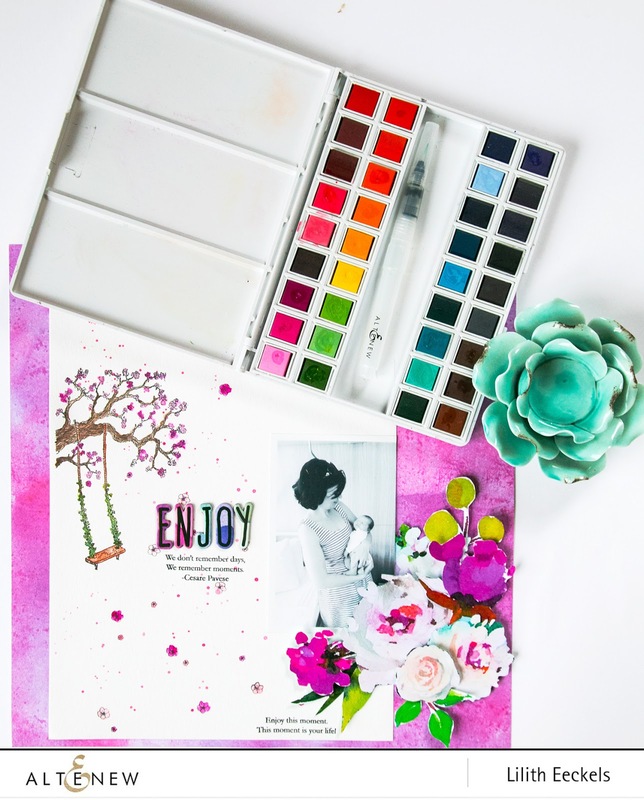 Love your sweet layout and how the watercolors match beautifully with Altenew's scrapbook paper. I like your layout and I love the colors you chose. Such a gorgeous layout and I love the colors you used. So beautiful and now I think I need these! I have never really thought to watercolour on a scrapbook layout! Wow! The colors are so beautiful and your layout is very lovely. Well done! TFS! Wow, that swing is beautiful and the layout is so well done, love it! A very pretty layout! Love these watercolors. What a beautiful layout! Now I have to try watercolors in my scrapbook pages! Such GREAT COLORS! A large lot of fantastic colors. Love the swing on the tree limb. It is nice to see these used on a layout. I enjoy scrapbooking. What a beautiful layout. The photo is so precious and the colors outstanding. Gorgeous layout and LOVE the vibrant water color combo! Gorgeous layout -- the watercolors look like fun. Great colors. That beautiful magenta color is the star of that page. Beautiful! Love the sentiments on your layout! Love how the watercolors match the ink line... great colors! So pretty! Love the layout! Thanks for sharing! Beautiful layout I love the sentiments you used. It’s nice to see these watercolors being used for scrapbooking and cardmaking. Gorgeous LO Lilith, love the vibrancy of these watercolors. Thanks for the inspiration! Love your layout. I want those watercolors. What a gorgeous page! That's a beautiful stamp set, and I love how the little flowers are cascading down the page as if the wind is blowing them. Such a beautiful scrapbook page layout! I really love how you water colored it! I just love the wooden swing hanging from the tree with the little flowers very pretty looking!! Such a sweet picture, the sentiments and the beautiful flowers and background are perfect with it. So nice to see the stamped images on this lovely page and the beautiful colours you have used. Great layout. Beautiful layout and lovely color pan set by altenew! Thanks for sharing this fabulous idea, love this watercolor palette to, the colors are so vibrant! What a gorgeous layout - love the swing! So pretty love your flowers! I love seeing stamping and watercolours on a scrapbook layout--beautiful! Absolutely gorgeous layout, I love the photo too!! So precious! A very SPECIAL layout! Thanks for sharing. Beautiful layout! You have inspired me to step out of my comfort zone and try watercoloring on a layout! Loved your layout! The Altenew watercolors are used beautifully! Thank you for sharing your inspiration with us. Sweet layout page using the new watercolor set! Such pretty watercolouring and just love the sweet layout. Beautiful layout! I love the photo! Pretty watercolor details in a beautiful layout! What a sweet layout and great half pan watercolor set! Beautiful coloring, fabulous page, Lilith! I love the swing in the tree and the colors you choose give it such a gentle look, LOVE IT! And I'm loving this blog hop! I'm finding out about so many artist I've never known about! the colors are wonderfully vibrant! perfect for your sweet layout!! Oh what a gorgeous layout! Wonderfully vibrant and you highlighted your photo so beautifully. Your layout is beautiful. I enjoy watching your process. The watercolors are nicely pigmented and look like fun to color with. Beautiful layout!! This is a fabulous watercolor set. Thank you for so much information in your fabulous video. What a gorgeous, delicate & stunning new baby piece of art, would be very proud to create something as good as this. Gorgeous work, Lilith. The new water colours are beautiful and you've used them to perfection! Thanks for sharing your creative process. Such a pretty layout! I love the tree with the swing! This is absolutely gorgeous Lilith. Beautiful work as always! Wonderful page, thanks for sharing that special moment with us. I love the watercolour set! The colours are so vibrant yet subtle. Love the layout and i will definitely try and recreate it. Thanks for the inspiration! What a pretty page! The colors are so lovely! Awesome release! Beautiful project! What a sweet layout! Lilith, that is a gorgeous layout & I appreciate your video explaining the process. Love the picture & the way you incorporated the swing. Makes you live in the moment as soon that baby will be on the swing. These watercolours look like they have rich pigment which is a boon. I'd love to be able to order them. What a wonderful page layout! The colors of this watercolor set just keep amazing me with each creation I hop to. I never thought to add watercolor to a scrapbook page! Yet another fantastic idea! Beautiful layout using these watercolors. Lovely, sweet page. I love the vibrancy of these water colors. Gorgeous layout!! The colors are fabulous!! Beautiful layout! Can’t wait to get the watercolors. A beautiful layout! I need these paints! Beautiful layout! The colors are so vibrant! This is so pretty! Love the pink background and painting of the tree! What a gorgeous layout! Thank you for sharing it! Beautiful layout. I love the vibrancy of these new watercolours. This layout- I mean REALLY! I love everything precious thing about it- the composition, the colors, and of course the adorable photo! Love! Love that your photo and sentiments pop against the color. Great layout! Lovely layout and beautiful colors! Hi Lilith! Your layout is ethereal :) Sooooo glad you'll be able to enjoy that moment thanks to your layout! Thanks for sharing! Beautiful background on this elegant layout. Thanks for the inspiration. I've only used watercolour to smoosh colour as a background on my scrapbook pages. You've inspired me to try something new! Nice to see watercolor used in a beautiful scrapbook layout. Beautiful Layout and fabulous colors! Thanks for the inspiration. I love your layout it is very pretty! Love the bright bold watercoloring and accents, perfect for that black and white photo! Your layout is so pretty! Love the colors you used and how these watercolors match the other Altenew products. TFS. I love the vibrancy of these water colors! Absolutely precious. And I love the quote. Your colors really make the page stand out! Beautiful colors in this watercolor pallet, the purples on your page are gorgeous! Thanks for sharing. Hope I win. Beautiful layout! I love these watercolors, so vibrant and soft. Thanks! What a beautiful scrapbook page! Love the soft, pretty colors against the mostly white background and how beautifully it all lets the photo take center stage! WOW, gorgeous layout. The stamp, sentiments and photo are so beautifully combined. Thanks for the inspiration. Gorgeous layout! Can't wait to try these pretty watercolors! A very sweet picture and great video. You are very talented. Great page! thx. Such a beautiful layout ! !